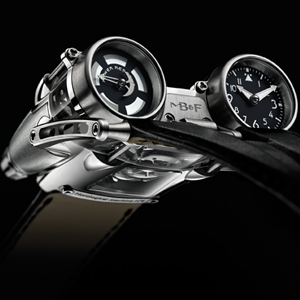 With its Horological Machine N°4, MB&F has broken with traditional watchmaking and presents a piece of kinetic art, organic, three-dimensional and totally unfettered, where the case and movement have become one. Born from the imagination of a child and the tenacity of a man, Maximilien Büsser, this fourth model of the collection, the most audacious yet, has been conceived and designed with the requirements of an engine in mind, with no fewer than 311 made-to-measure components. 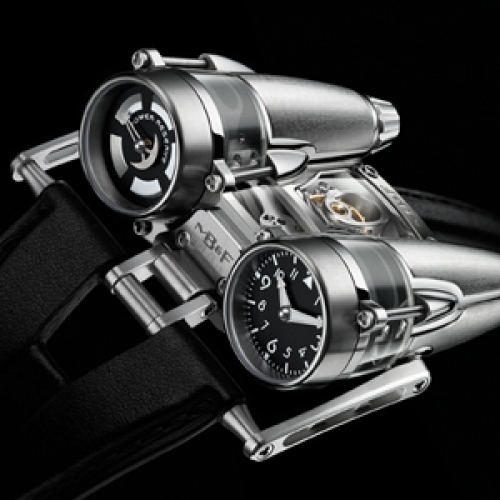 The sleek aerodynamic lines of the titanium and sapphire body conceal two parallel barrels that transfer their power to two identical turbine-shaped pods that display the functions. 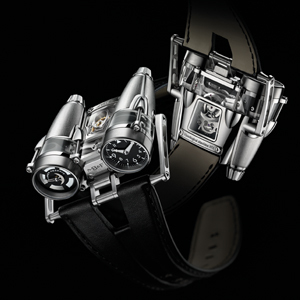 The cockpit in the centre reveals the balance, openworked in the middle to display most of its oscillating wheel, a micromechanical panorama with sophisticated finishing. 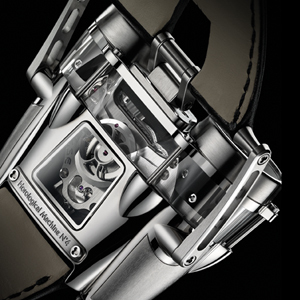 A blend of complexity and rarity, this timepiece will be produced at a rate of one or two per month!